We’re your locally owned and operated roll-off container solution! 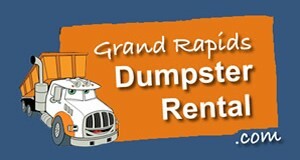 Grand Rapids Dumpster Rental serves the greater Grand Rapids area and most of West Michigan. 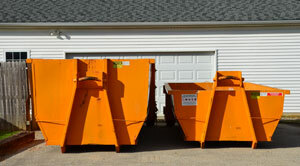 We offer 10, 15 and 20 cubic yard dumpsters that are ideal for both residential and commercial jobs. You can count on Grand Rapids Dumpster Rental to be there on time. We’ll make every effort to accommodate your schedule and even deliver the same day you call in many cases. Best of all, we’ll answer the phone when you call! That’s more than many “big box” rental companies can say. 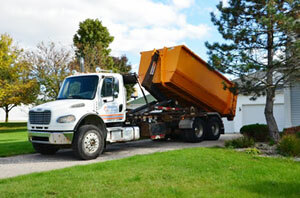 When you need a dumpster fast without all the hassle, give Grand Rapids Dumpster Rental a call at (616) 827-7121. The rental process is quick and easy, even if you’ve never rented a roll-off container before. We’ll help you determine the right dumpster size and inform you of everything you need to know about it. We have an additional charge of $10.00 per mattress or box spring. With our expertise, we can estimate the amount of waste or debris you have, and then suggest the ideal solution for disposal. Whether it’s a 10 yard bin for roofing debris, or two 20 yard bins for a complete house cleanout or major renovation, our expert team will determine the most efficient and cost-effective plan of action for your project. We offer three convenient dumpster sizes to choose from. Our 10 yard and 15 yard bins feature a footprint ideal for residential use. These containers feature relatively short sidewalls that make it easier to load heavy debris over the side. Go with our larger 20 cubic yard bin for bigger cleanups, such as a house or building cleanout, construction/demolition, or renovation project. The 20 yarder is a cost-efficient option for many different projects. It’s a great choice for residential and commercial use, as it nicely blends a large loading capacity with a relatively compact footprint that fits well in a driveway.